Have you noticed I posted every day this week, as opposed to my usual three times a week? I thought I would try it out. What do you think -- would you like daily posts, or do you prefer every other day? Today's look was inspired by Song of the Exile -- I think our dress is even the same, at least they were both by Max Studio, only her sleeves are longer. Sooooo. I've been kind of bad. There are two thrift stores within walking distance of my house. Walking is healthy. Exercise is good. I like to trick myself into exercise by telling myself I can go browse the thrift store. But um, I shopped a lot. I'm not proud. This sweater, I love. Ann Talor Loft, $3.50 perfect to layer over a dress or with a pencil skirt or jeans. 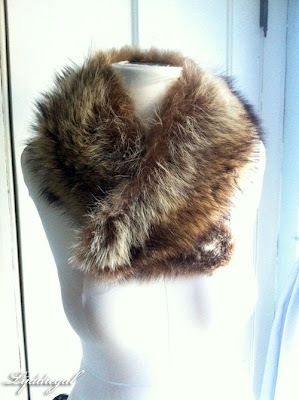 The real Fur Collar - kind of a big purchase at $15. Includes possible guilt factor. 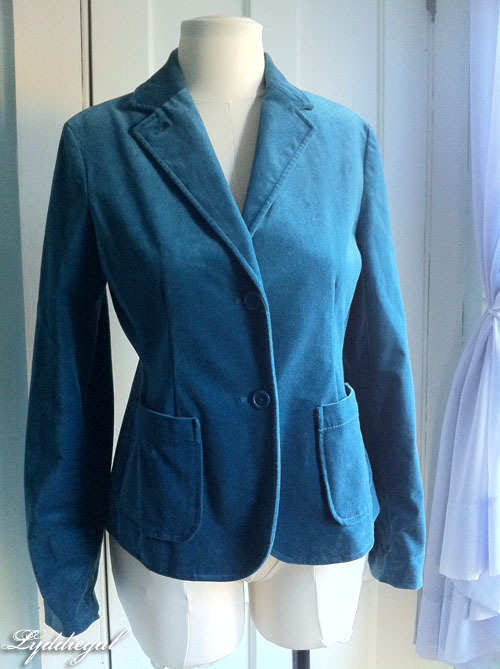 Blue velvet blazer from the Gap. $3.75, I love velvet a lot. Gold woven belt for a $1 was a complete rip off since it's quite worn. I tried to get for half off, but no luck. 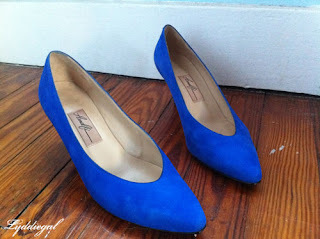 Blue suede pumps from Italy. You know I can't resist goods from Europe, especially for $2. Black velvet pants for $5. I'm going to skinnyify them, hence the one pinned leg. 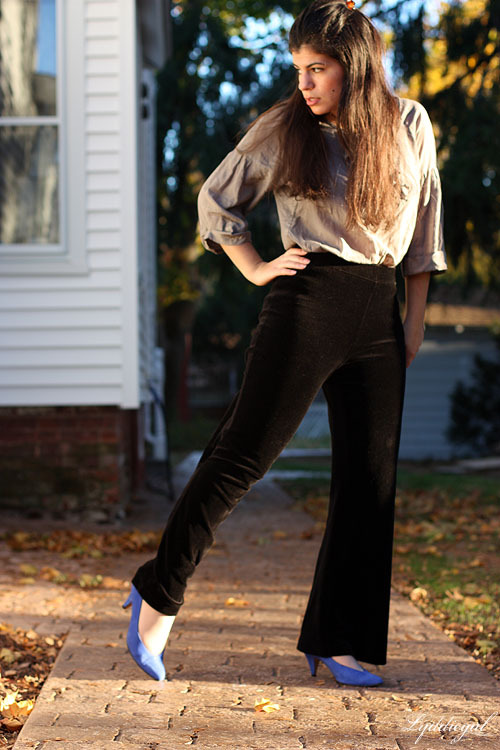 They are super high waisted, which I'm not sure about, but I had a sudden urge to own velvet pants. Well Style Nation, have I been a bad shopper, showing my weakness and bringing home lots of things I don't need? Note: Sorry about that truncated post that went up - struggling with internet! Ooh, I love all the finds on here - those velvet pants will be amazing once skinnified. I've just followed you on Bloglovin. It's always great to find another budget-conscious person who loves clothes! And Chloe is adorable, as usual! maybe a happy medium of 5 days a week? I can't keep up to comment enough, lol! I enjoyed the every day posting even though I wasn't keeping up with my Google Reader this week! Those are all fabulous thrift store finds! My mom just gave me my grandmother's white rabbit fur collar last weekend. I never thought I'd be one to wear fur, but it makes me feel like a million bucks! I did turn down the mink furs that still had the heads attached... that was too much for me! - your buys are HEAPS awesomme, but they're not rip offs if they're going towards charity? are they op shops? or just 2nd hand shops? - either way, you win :) as long as you wear everything heaps!! my chloe loves your chloe, dog playdate perhaps? Your outfit is so nice! Those colors look great on you! haha. I wish we had nice thrift shops around here! I am in love with those pumps and that ann taylor loft sweater! and that puppy is ADORABLE! Everyday posts are good, but don't feel pressured to do it! You've got a life to live too. I know this is going off topic a bit, but would you mind explaining exactly what a thrift store is?? In the UK we have charity shops, staffed by volunteers and selling goods (clothes, books, knick knacks, records etc) donated by members of the public. All the profits will then go to the charity. I volunteer in an Oxfam shop, one of the bigger charities. My local charity shop only sells furniture, and raises money for a local hospice. Is it the same in the US? Because here in the UK most people wouldn't ask for money off because they know they're giving to charity. But then again people in the UK have a different attitude to money - especially tipping! I like you here everyday, the more you the better! I think the shopping "extravaganza" was not really a big thing. You got some stuff you really like and I'm sure you will use. Post more, post more, post more! I love the recreation of the outfit too.. great outfit today AND yesterday!! Don't feel guilty for your finds!.. they're totally good prices. I love the blue velvet blazer and the suede pumps! Your dog has a leaf sticking out of it, awww. Gasp, I love your thrifted purchases, especially that large fur collar! I've been buying tons of fur collars this season but I'm still looking for one as plush as that one! i'm in love with this outfit! it pretty much screams Autumn! and the cardigan looks so cozy. :) these pictures turned out beautiful! Casual and perfect, great outfit!!! Love last picture, the dog is so cute! your dog knows how to play his cards - absolutely adobraly! and i love your inspiration! I think it's great that you posted every day this week. I've reduced the number of times I post to around 4 a week. 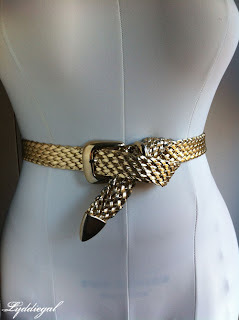 The Ann Taylor and gold belt are so worth more than what you paid for them. Good buys! I llloooovveeee your blog! such amazing finds, such as...the pumps, the blazer, the collar, and the sweater. mostly everything. haha :) your outfit is adorable, great layering! You got some great stuff at the thrift store! I love the blue pumps! Always wanted to have a friend with blue suede shoes! Ah! That scarf is lovely! I want to see the pants after you skinnyify them. I used to own a pair of "velvet" black pants a few years ago. I wonder what happened to them. I think you hit the jackpot at the thrift store! 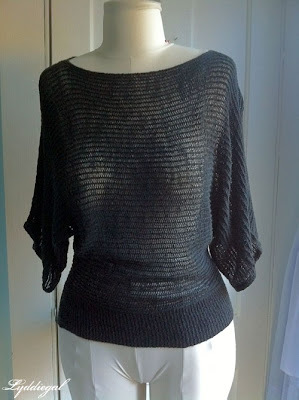 i don't blame you for being tempted by the thrift stores...your finds were amazing! my favorites are the ann taylor loft top, the fur collar, and that little vintage purse! 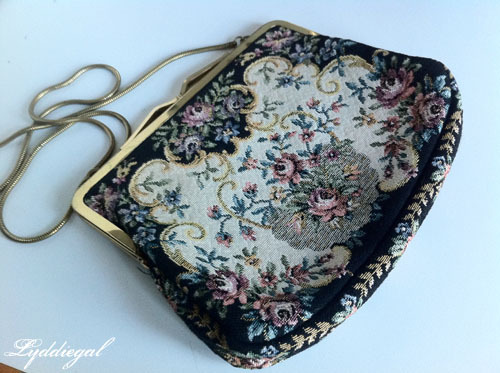 if you have the purse as one of your give-a-ways, i sure want to covet it! 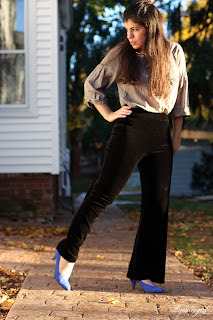 and those high-waist velvet pants are hot :) great purchase. Yes! I noticed the upturn in frequency this week. 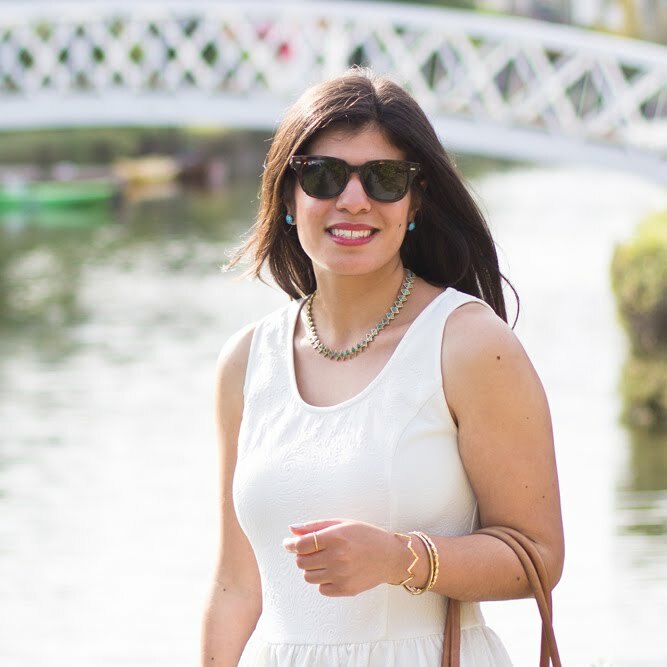 Does taking many of your outfit photos over the weekend help give you the time during the weekday to post more? (Or, maybe your weekend pics was just a one-shot deal and your back to taking photos once a day, daily?) Whatever the case, I adore the surprise of seeing a fresh post from you! I hope you don't wear yourself out! Nice! I wish I lived near just one thrift store! Those are some great finds. I absolutely adore your outfit, too! Great blog, love it! Fab style too! Very adorable and cozy fall outfit! I'll read as many as you post! LOVE that bag! exercise is healthy as is thrift shopping because you get more bang for your buck. :) Daily posts would be awesome. I wish I could blog everyday! Geez. I kind of envy you! Your outfit turned out cute from the inspiration photo! I want that sweater she's wearing! Oh gosh. A thrift store THAT close to my house would be too much for me to handle. It would probably encourage exercise, but that would bee too much temptation!! that is a beautiful look for fall. .and those vintage finds are amazing. love that bag! love love love your outfit, you look so so so lovely and stylish. would you like to swap links, i love your blog!! I love the cardigan, plaid number with those tights. Super cute. I need to find something like that for Thanksgiving day. Ooh, but those blue suede pumps were such a steal! No need for shopper's guilt when it's so affordable!